Learn Scuba Diving & Snorkeling, become Dive Master or Staff Instructor - or just join one of our diving trips to the best dive sites. BB DIVERS, Five Star PADI IDC Dive Center, is a Belgian dive school working with an international divers team, we have been diving on Ko Chang, Thailand since 2003. We offer fair prices including free pick-up on the west coast of Koh Chang, food, coffee and tea, soft drinks, PADI certification, PADI manual, use of all equipment, licensed dive guide for fun dives, licensed instructor for courses. In short, prices include everything, there are no hidden extras after signing up. We sell dive equipment, well known brands as Scubapro, Seac sub, Oceanic and all PADI materials. Our main office is in Bang Bao fishing village, directly at the pier. 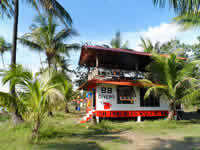 The BB training pool, rooms, restaurant, gym and lounge are in the village ofLonely Beach, directly at the main road. Courses are held in English as well as Dutch, French and German! In April 2007 BB DIVERS was awarded as ’PADI Five Star Dive Centre’, thanks to the effort we put to keeping our equipment up to date, our customers happy, and the quality of the diving courses our main priority. Since October 2007 we are IDC Center, and started with instructor training, since then we ran very successful IDCs and have instructors working around the world! 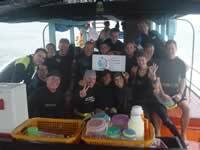 BB DIVERS is the first facility to organize IDC on Ko Chang! In May 2007 we were awarded a ‘Reef Check Facility’, thanks to the effort we make in working with environment minded divers, and train the new ‘Eco Divers Course’ to help and protect the living coral reefs. Several times a year we organize a clean up diving day, and every year we join in the big Ko Chang clean up organized by the national park. 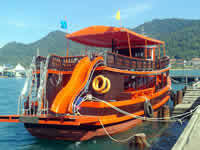 Our boats are original Thai boats, comfortably adapted for diving. There is plenty of space to relax for the non divers, and to have a nice chat or siesta on the way back from a diving day on the sundeck. We take a small speedboat as well to the dive sites for safety or pick up. Our smaller boat ‘Lek’ is fitted with 40 tank racks, and has a great sundeck on top to relax between the dives. It is nice and cosy, and gets us to the dive sites fast. From Koh Kood we operate of a wooden boat as well, on Koh Mak we use a smaller speedboat. Every day we go out on our own boat for a relaxed day trip. We either travel to the local sites around Ko Chang, Ko Maak or to Ko Rang National Park, where we enjoy the clear waters and pristine coral reefs of this protected area. Most places are good for diving and snorkeling. We visit two or three spots, and on the Ko Rang trips we have lunch close to a beach where we take the time to relax between dives. One of the most populare dives is the shipwreck HTMS Chang, so we dive there every other day. Best time of the year is September to May, in June to August we go out weather permitting. Divers are guided by the dive master, we dive in small groups and use of full equipment is included. A digital underwater camera can be hired or we can provide you the pictures of the diving day on CD. Join and have fun ... Wanna have a try? Snorkelers get full equipment; there is a snorkel briefing before you enter the water and a local snorkel guide to show you the best spots. 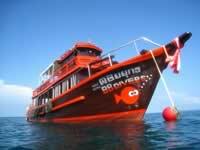 We dive and snorkel from the same boat, 80 % of the dive sites are very good snorkel sites. If we like to dive the deeper ones then we take the divers there with our small speedboat while the BB boat stays with the snorkelers for safety. On busy days we organize separate snorkel trips. Every Sunday we go out for two dives in the afternoon and one night dive, no reason to get out of bed early! If you’ve never have done a night dive before, this is your chance to experience the nightlife under the water. On request we organize a weekly basis we organize a boat trip to Ko Mak. In the morning we stop the boat for diving and snorkeling, we have lunch on Ko Mak and stay a few hours to visit the island or laze on one of the beaches. Around 2 pm we leave for a second dive, and head back to Ko Chang. On request we organize a 2-day trip (around 15th and 30th of the month). We take the boat out for an adventurous dive holiday, on which we dive some of the known dive sites, but also go of exploring some possible new sites. We sleep on the boat, or for those who prefer some luxury we drop them on the island to spend the night in a bungalow or resort. The price is including all activities on the boat and the visit to the islands, not included are the extra costs if staying on the island. Ko Maak area; visit to the beautiful tropical islands Ko Kham or Ko Rayang, and have a visit on Ko Maak, nice scenery with lot s of coconut ringed beaches and rubber trees covering the island. Ko Kood area; visit to the unspoiled beaches and one of the lovely waterfalls on Ko Kood, it is a real Robinson Crusoe feeling when we cruise up the river in the little dingy to the waterfall. We teach in English, Nederlands, Francais, Deutsch, and Thai ... and have the PADI learning materials (books and video) in more languages including Swedish, Danish, Finish, Norwegian, Spanish, and Italian. The prices include all, food, drinks, pick up from hotel, use of equipment as well as the books and the certificate. Our classrooms are in Bang Bao village or at the trainings pool at Lonely Beach. Confined water is taught in the BB pool or from the beach. For the diving we go out with the BB boat. 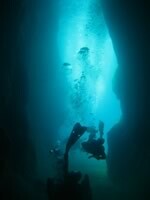 'The experience' for non-divers who want to give diving a try. On the first day we show a video and explain diving theory, followed by water training in our own BB pool. The second day is a full diving day with 2 dives. 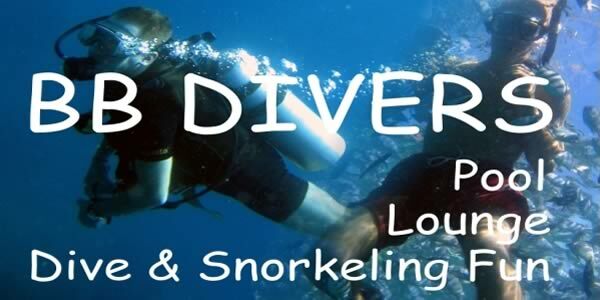 This gives you a limited certificate to dive to 12 m, under guidance of a PADI professional. The Open Water Diver is the first course that gives you a full diving license, your ticket to the underwater world. After the theory session with video, there is a half day of training in the BB swimming pool. Then you are ready to go out on the boat for the next 2 days, the training includes 4 dives on different dive sites. This license allows you to dive in open water to max 18 m.
It takes 2 days of diving to become a specialist in your field of interest. Dive master training is our BB speciality, every year we train many and are proud to bring some of the best dive masters to the diving business. All of them found work easily and are currently working as divers all over the world. 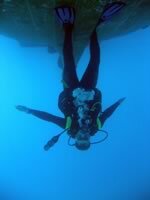 We offer a complete, tough but also fun training course, which covers all the aspects of ‘the diving job’. The DM training prepares you to guide divers, organise the diving, maintain equipment, help in the dive shop and assist in training sessions with an instructor. The Divemaster training program can take from 3 to 8 weeks and consists of academic training, and "on the field" assisting with every possible task there is to be found in and around diving. The Assistant Instructor can be organised according to your planning. It is a great preparation for the IDC, and gives you more time to practise your teaching skills and get some experience before an IDC. An AI is a valuable help in any dive centre. Become a PADI instructor and work around the world! The Instructor Training is split up in two parts: 5 days Assistant Instructor and 5 days Instructor. Please mail for more information on IDC dates, we run 3 IDCs a year. Becoming Instructor will change your way of life, being able to work anywhere in the world is for many a dream come true, the PADI license is widely recognised and one of the highest levels you can get in diving. To become a Staff Instructor you become an Instructor Trainer, assist a complete IDC, where you’ll learn how to teach some of the IDC theoryrebuilcan train assistant instructors, if they are working at an IDC centre. This course is in cooperation with www.reefcheck.org, a coral reef monitoring and protecting organization which operates around the world. We teach you how to recognize coral diseases, how to measure and compare reefs and their condition. If nature interests you, then this course will give you an extra reason to dive, and help preserve our underwater beauty. ... Next to the restaurant you will find the BB Gym where everyone is welcome for a work out or a yoga session. Since June 2008 we’ve rebuilt the shop, where we offer a nice selection of dive and snorkel equipment. BB Divers Koh Kood is perfectly located on Klong Chao main road, just next to the river leading to the famous Klong Chao waterfall. The dive center is easy to reach since we are on the main main road, the second center is in Siam Beach Resort, where we keep the boat parked on the pier. The beach offers a great spot for dive training and it is easy to train first dives since we have a house reef just in front of the shop and many good diving spots just a boat ride away. Would you like to refresh your dive skills? Walk in and half an hour later you are in the sea practicing your dive skills and getting ready for your next dive trip. 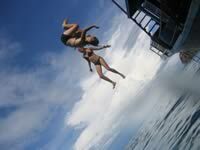 For the fun dives, course dives and snorkel trips we go out by speedboat. Many resorts in Koh Kood are on the coast, allowing us to pick up the divers by boat and take them directly to the dive sites. Our latest office in Ko Mak opened in 2013, it is on the main road close to Monkey Island Resort.